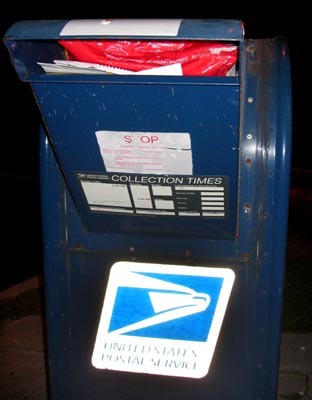 The post office was closed today due to the President’s Day holiday and I tried to drop an envelope into the drive-thru mailbox but couldn’t, it was absolutely packed and overflowing, really…stuff was sticking out of the opening. So I went inside the post office, the drop box on the wall was also packed and couldn’t even be opened but a couple of inches because there was so much postage in it. I tried to use the automated postage center box, the thing wouldn’t even open as it too was packed to the gills. The population in Kona is growing at an incredible rate. The roads are choked with traffic, the post office closes for one day and every postal orifice is packed to overflowing. I finally had to just shove the envelope past the blockage and hopefully it didn’t get damaged in there. Next PostNext We’re 1st Place! Amongst the losers.